Congratulations to meteorology majors Elissa Smith ’19 and Drew Koeritzer ’18 on being selected to the NOAA Class of 2016 Hollings Scholars. 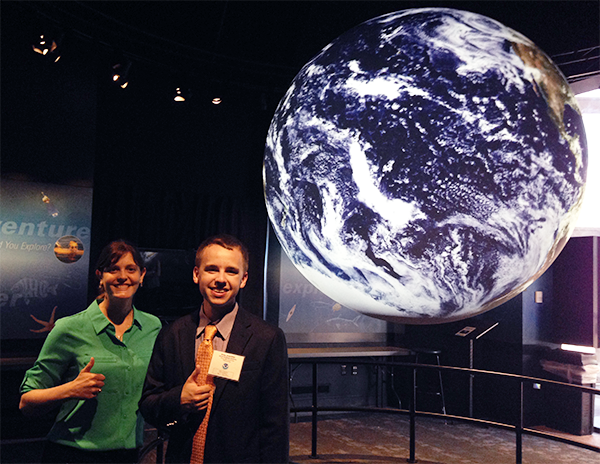 Elissa and Drew will spend their first summer at the NOAA headquarters in Washington D.C. The National Oceanic and Atmospheric Administration (NOAA) Ernest F. Hollings scholarship program increases undergraduate training in oceanic and atmosphere science. The program provides a paid summer internship that gives students hands-on experience and training in NOAA-related science, technology, and research. Included in the awards are travel funds to attend the NOAA Scholarship Program orientation, student presentations at conferences, and a housing subsidy to help scholars who do not reside at home during their summer internship.